There is something intensely fragile about the act of creating; the process itself becomes a search for solace. Memory, love and nature are approached in tones of respect, forgiveness and awe while keeping blackness at bay. These intimate paintings and drawings are recognizable as images of physical exchange but are at times difficult to distinguish. The viewer is asked to weave and unweave bodies like nettles and vines, as reality melts underfoot. Figures are vainly captured then released creating new meaning in juxtaposition while rich texture and vibrant colors stir the senses to reveal the curious work of an artist’s hand. “Double exposure” forms dissolve into and suggest another, forging new relationships that blur the lines between organic pleasure and moral prohibition. 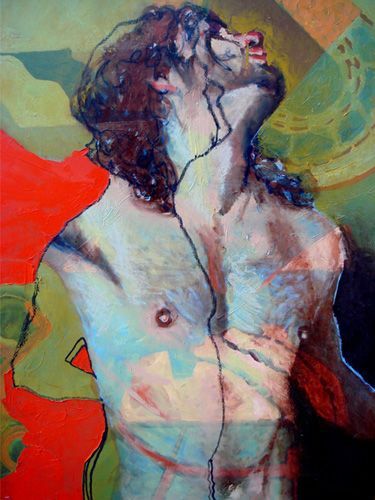 David Crocker received his Bachelor of Fine Arts degree with honors from Michigan State University, studied painting in Florence, Italy, and was classically trained at the Pennsylvania Academy of the Fine Arts in Philadelphia, PA. His artwork has been described as “dripping with raw emotion and vibrant color” by the LA Alternative Press. He was the recipient of the Award of Merit from the “Expressions West 2004” exhibition at the Coos Art Museum in Oregon and winner of the Fred Kraus Prize at the “22nd Annual Faber Birren National Color Award Show” in Stanford, CT. He is a Juried Member of the Los Angeles Art Association and the Silverlake Art Collective.